Here's the story... originally, I had a Spaceballs cake order due for yesterday. This was taken months in advance. So, I planned accordingly and took two days off work, enough time to complete it. Then, a couple of weeks ago, a colleague asked for a baby shower cake. I didn't want to say no, so I said yes, thinking I had ample time. Who could've predicted that I'd get sick on Valentine's day and did not get better until a week passed? The last couple of days were hectic, let me tell you! Staying up Friday night 'til 2am baking was not fun; I felt like keeling over from sleepiness. Unfortunately, due to my lack of time, the photos are not taken in natural light. The couple: die-hard Spaceballs fans. I mean, quote-every-single-line-from-the-movie-type fans. 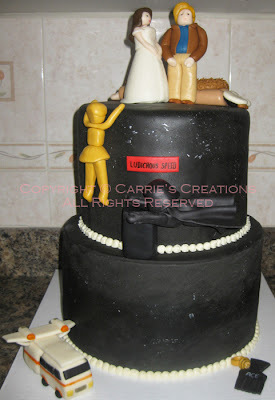 She wanted tall cakes, so each tier (8" and 10" rounds) had 3 layers... making it over 12 inches high. It was so HEAVY! 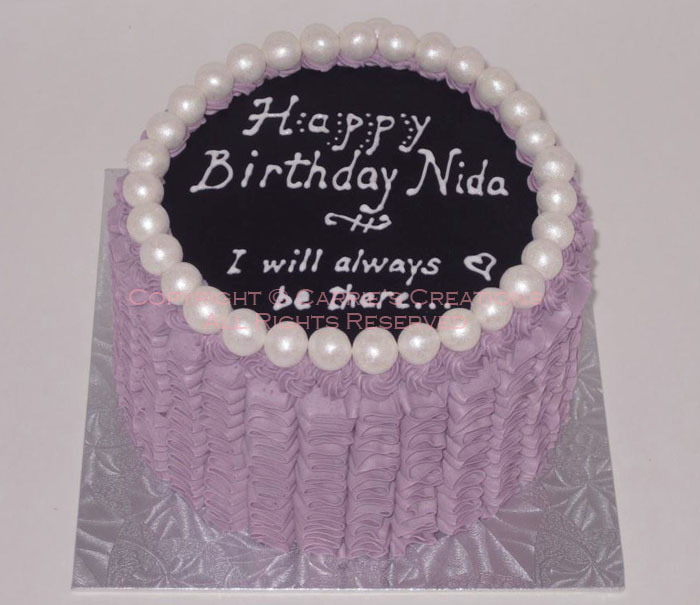 The cakes were red velvet with cream cheese icing, wrapped in black fondant. All the decorations were made from either fondant, gumpaste or modelling chocolate. The Winnebago and Princess Vespa's dress had Rice Krispies treat bases. If you've seen the film, you'll get the little details I tried to represent. Happy Jack 'n Jill, Kristina & Gary! 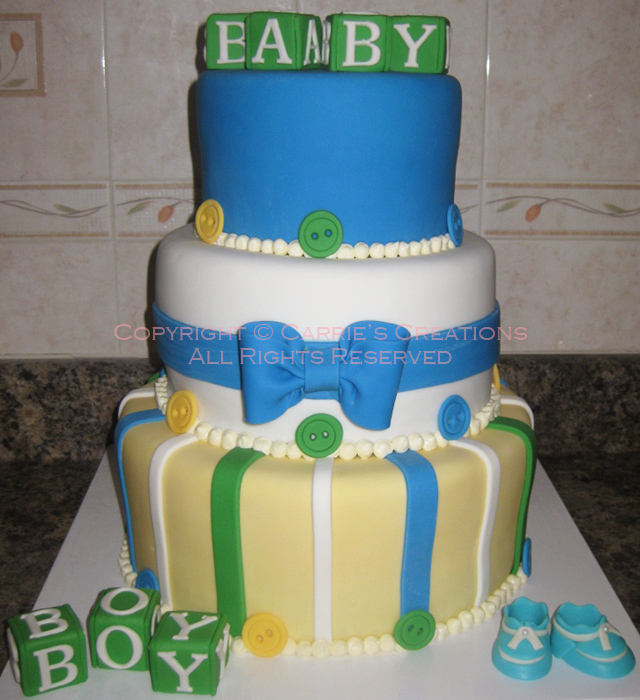 This cake was based on an existing design, but I've switched some elements, like adding the blocks and booties. The blocks had Rice Krispies treats as the foundations. All other elements were made of gumpaste and fondant. The filling for all tiers was vanilla Swiss meringue buttercream icing; the top 6" tier was red velvet cake; the 8" middle tier was vanilla cake; the 10" bottom tier was marble cake. I now understand why the cakes from televised cake decorating competition shows could get so heavy! Both were completely assembled when I put them in the trunk... and remained intact during the delivery process! It's so nice to not have to carry any caking supplies to set up the cake... but the trade off is the possibility of it falling apart along the way and lifting a product that weighs a ton. These one-bite treats are addictive. 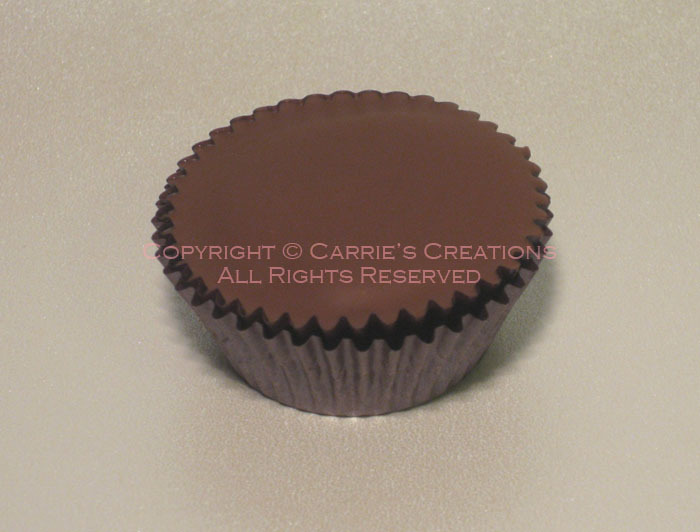 Very popular at the office, it will satisfy your chocolate craving. It is a combination of my chocolate cake recipe, vanilla Swiss meringue buttercream icing, topped with Belgian milk chocolate. Someone from work decided to take an opportunity out of the department, but she still would be in the same office. I wanted to make farewell treats, anyway. 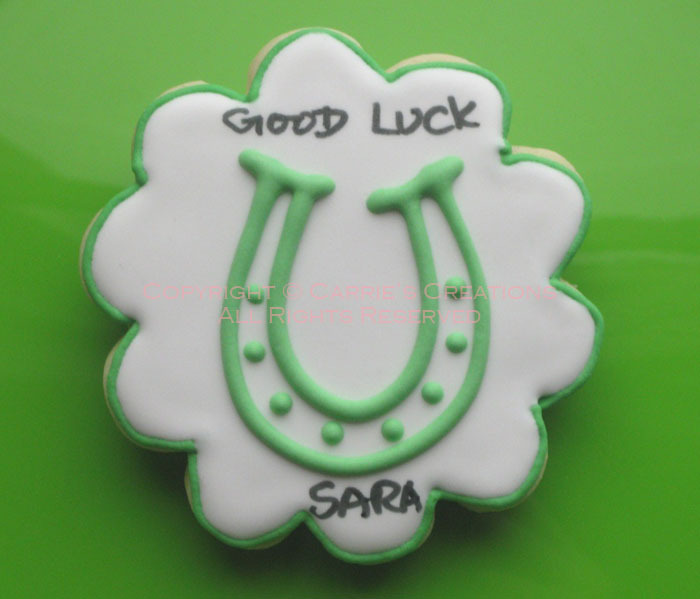 The sugar cookie was simply adorned with a horseshoe and written with edible marker (some people that I used a Sharpie - I thought that was funny). Congrats and Good Luck, Sara R! My first-time Mommy friend was having a baby shower and I was asked to bring something. 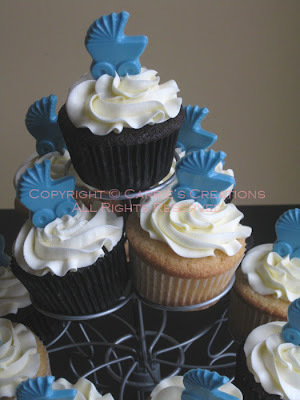 Initially, I had wanted to make the vanilla Swiss meringue buttercream blue, but the prams were blue (moulding wafers). In the end, I thought the chocolate and vanilla cupcakes made a better impact with its simple adornments (and no one had blue teeth). My "little" 25-pound baby turned two this month. He's not speaking with words yet (long story short, we found out he's only been using 35% of his hearing but will be having surgery to correct it), but he seems to like Thomas. Due to my schedule and whatnot, I only could decorate his cake on the DAY OF HIS PARTY. Talk about pressure! Being off maternity leave to plan parties is tough! It took me 3 hours, but I thought it turned out OK. Thomas in his most basic form. 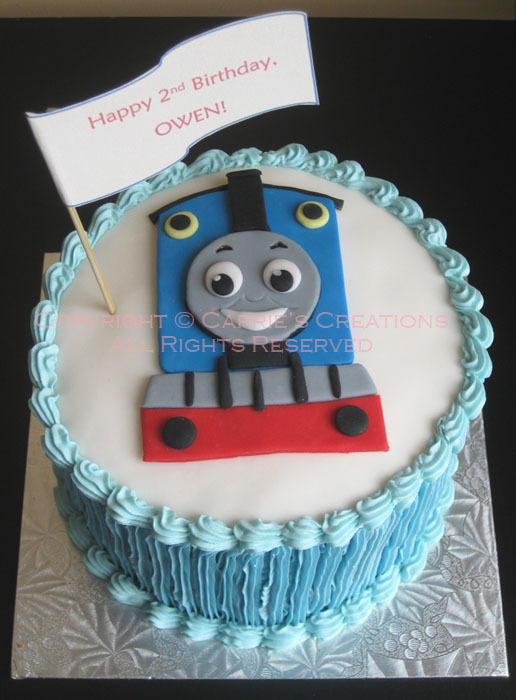 The whole cake top was fondant, with a non-edible birthday flag. The cake itself was chocolate with vanilla Swiss meringue buttercream icing. My colleague wanted a red velvet cake for her friend's birthday. A girl who likes purple and girly things. I chose pearls and ruffles because she sounds like a classy gal. The cake top is black fondant with a royal icing message.